Florida Farm Bureau members from across the state will meet with legislators during Florida Farm Bureau’s annual Legislative Days in Tallahassee, February 2-3. 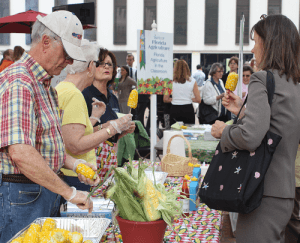 The state’s largest general agricultural organization will host a major legislative event to give members the opportunity to meet with state lawmakers and discuss key policy issues that affect agriculture. Priority topics this year include water and environmental resources, transportation, agritourism and fire codes. The two-day event will kick off with a legislative briefing dinner at the Tallahassee Automobile Museum and will conclude with a networking “Taste of Florida Agriculture” public reception at the Capitol Courtyard on Feb. 3 at 5 p.m.
Consumers will have the opportunity to sample locally grown Florida commodities, meet family farmers and learn about the importance of an economic sector that provides nearly two million jobs in the state. The reception is a joint partnership between Florida Farm Bureau and the Florida Department of Agriculture and Consumer Services. Guest speakers will include Florida Commissioner of Agriculture Adam Putnam and Florida Farm Bureau President John Hoblick.